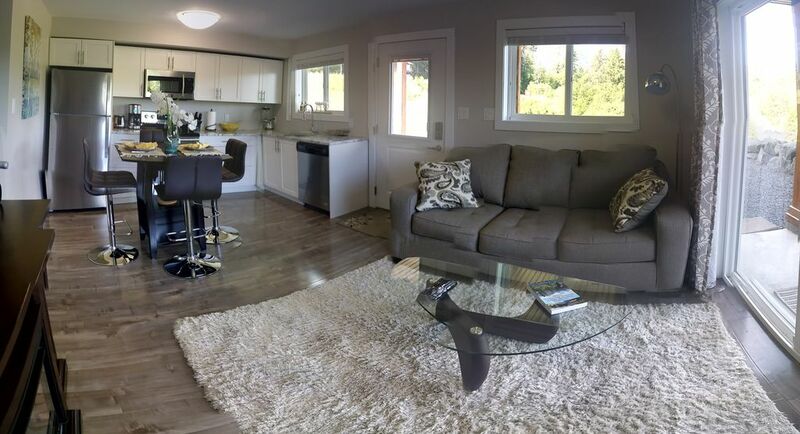 Located in the beautiful town of Lake Cowichan this well appointed one bedroom suite will allow you to enjoy all the comforts of home while exploring everything the area has to offer. The living room has an electric fireplace, cable, Netflix, and a comfy couch that expands into a memory foam Queen bed. The kitchen boasts granite counters, stainless appliances, and every amenity you might need. Enjoy dinner on your private patio overlooking the large games yard, views of lake mountains and famous Cowichan sunsets ... complete with bbq and dining area. Finish the evening with smores by the fire. RV and Boat parking available on site- We are located directly across from the marina and only 15 min walk / 5 minute drive to the public beach. Or, take the 15 min stroll to the famous river float and local pub! We liked it so much, we stayed again! The unit has all the amenities of home, it's quiet, and close to town. Hosts are awesome and very attentive to your needs. We highly recommend it! Beautiful new level entry suite with a view of the lake. My business partner and I were on a working weekend retreat and appreciated the quiet of the small community in the off season (even tho in my eyes there is never an off season on Vancouver Island). The suite had a fire pit that we would have loved to take advantage of but unfortunately work took over. Definitely a destination I would recommend. Awesome place :) Very accommodating nice and cool inside even without air and you don't hear the upstairs at all. Thank you for the stay we had a wonderful time !! Great place kept very tidy, stocked and "homey"
We had a lovely time as a couple with our toddler. Gorgeous views, comfy bed, clean and well-kept with all the comforts of home. Pictures depict property exactly as is! Thank you.